The HDC48 takes audio performance to the next level with new audio converters and advanced DSP algorithms that make full use of the processing power offered by the latest 4th generation SHARC DSPs. Unique to the industry on the HDC48 are the revolutionary new LIR Linear Phase crossover filters, and for the ultimate in driver protection with maximum SPL, the new VX Limiters. These are not marketing gimmicks; they are carefully implemented, powerful tools that allow to extract the maximum performance from NOVA sound systems, safely. The HDC48 is a high performance, easy to use signal processor for loudspeaker systems, providing processing for up to 4 inputs and 8 outputs. Taking advantage of the latest advances in analogue to digital conversion and digital signal processing technologies the unit achieves performance levels higher than all previous devices. 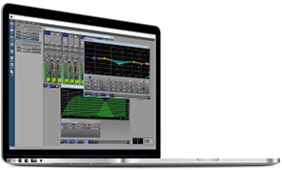 The HDC48 provides generous amounts of signal processing capability and a wide variety of crossover shapes. Three rotary encoders, illuminated buttons and graphical display provide a rapid, intuitive and userfriendly control interface. The powerful drive module concept allows for abstraction from device centric to speaker based control. The HDC48 uses drive module presets, which are defined as a number of outputs driven from one DSP input. This system allows for better flexibility and greater functionality when loading and storing presets. Drive modules allow for a less processor-centric and more speakerorientated system design. The HDC48 allows 50 drive module presets to be stored. 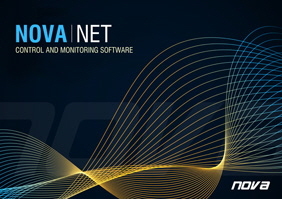 Presets are stored permanently inside the HDC48 and so will always be available even if the HDC48 is not being used with the NOVA.Net software. The LIR linear phase crossover shapes give FIR-like performance without the drawbacks. The linear phase HF system EQ profiling provides perfect integration between enclosures. As well as the standard Butterworth, Bessel, Linkwitz-Riley and Hardman filters, the HDC48 offers a unique “Linear Impulse Response” (LIR) crossover filter which gives a linear phase crossover that has a constant delay regardless of frequency (unlike other types of crossover which delay different frequencies to a different extent, thus smearing the arrival time). The LIR crossover can thus be described as having a flat group delay response, and thus entirely free of group delay distortion, this is exactly the same as can be provided by common FIR filtering but without the complications and disadvantages inherent with the FIR technique. The shape of the LIR crossover filter is similar to a 4th order Linkwitz-Riley filter, and maintains zero phase difference between the adjacent bands across the crossover region to keep the polar response rock steady. As we also employ phase matching on our Bessel filters, adjacent bands are in-phase throughout the crossover region. The input high shelf EQ is implemented using a „Finite Impulse Response“ (FIR) filter, and exhibits a linear phase response; that is all frequencies are delayed by the same amount. To avoid unnecessary inter-band phase shifts common in many competing products, the HDC48 provides high-pass filtering on the inputs rather than forcing you to apply ‘system’ high-pass filtering on the low crossover bands. The HDC48 offers AES3 inputs and outputs switchable in pairs as standard. The Dante audio networking card is available as option. 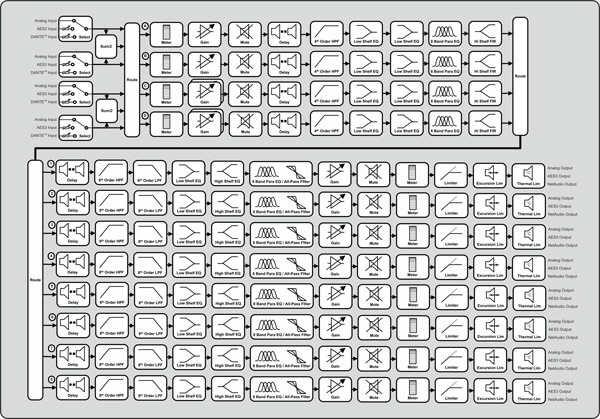 the user on the application control panels, but also show when scrolling through the inputs and outputs on the device itself. Even a HDC48 firmware update can be made easily via the network. The HDC48 includes a high speed ethernet communications interface that supports DHCP, static-IP and auto-IP and direct connection to a computer without the need for a router or a switch.